Avro Lancaster Mark IIIs of No. 207 Squadron, Royal Air Force, strike Berlin in late 1943. The Avro Lancaster rained terror on Germany but never attained the B-17’s fame, even though it could carry twice the bombload over an equal distance. It was a catalogue of aircraft encapsulating several nations’ worst aeronautical excesses, in a manner that today might be considered politically incorrect. The Italian fighter was double-ended so it could switch sides instantly. The Japanese Kak­aka Shirley was an amphibious pedal-bomber, and the American candidate was a primary trainer with all 19 student pilots under one 50-yard-long greenhouse, for the sake of economy. Ouch. But not far from the truth. Handley Page Heyfords and Hampdens, Armstrong Whitworth Whitleys, Fairey Hendons, Vickers Wellingtons, Short Stirlings—a long string of mulish two- and four-engine bombers with all the grace of railroad boxcars and not much better performance had been the Royal Air Force’s stock in trade for far too long. Yet sired by this force of low-and-slow bomb trucks came the single most useful heavy bomber of World War II over Europe: the Avro Lancaster. Not as stylish or high-performance as the Boeing B-17, the lumbering Lanc forewent coolness points in favor of typically carrying two or three times a Flying Fortress’ bombload to Germany. The Lancaster’s bomb bay was so huge that it was the only WWII airplane that could heft the RAF’s 22,000-pound Grand Slam bomb and take it up to 18,000 feet, an altitude that allowed it to attain a near-supersonic, concrete-penetrating terminal velocity. Grand Slams were so expensive—only 41 were ever dropped on German targets—that Lanc crews were forbidden to jettison them. The special Lancasters that carried them not only had bellied-out bomb-bay doors but special landing gear for overweight landings. Hard to imagine, but the Lancaster was directly descended from the twin-engine Avro Manchester, the least successful of the RAF’s covey of “heavyish” bombers. The Manchester project involved that bane of aircraft builders, a new airframe plus an unproven engine, the Rolls-Royce Vulture. The Vulture was an X-24: four banks of six cylinders each, arranged in a star pattern around a common crankcase and crankshaft. The cylinder banks were from Rolls’ Peregrine V-12, a small, 880-hp predecessor of the Merlin. Rolls hoped the Vulture would generate 1,760 hp, with further upgrades inevitable. But it turned out that localizing all 24 connecting rods around a single central crank created cooling and oil-feed problems, and the Vulture probably never ran semi-reliably at more than 1,450 to 1,550 hp and too often spun its bearings. So Avro was left with an excellent but underpowered twin-engine airframe. The Manchester’s designer, the legendary Roy Chadwick, saw this coming and had already made plans for a four-Merlin-engine Manchester. The Air Ministry, however, wouldn’t hear of it. Avro asked for the necessary engines and scarce aluminum alloy to create a prototype, and was told by one particular Colonel Blimp to go pound sand. Actually, he told Avro to “go dig for it.” As far as the RAF was concerned, it already had the four-engine Handley Page Halifax and didn’t need to complicate the picture. The Lancaster was developed from the twin-engine Manchester. (Hulton Archive/Getty Images). As it turned out, Avro had some very good friends at Rolls-Royce and found itself in possession of four Merlins. The engineers scrounged up the necessary metal for a prototype, and the resultant Manchester III was quickly renamed Lancaster, in order to cast off any suggestion of its unfortunate parentage. Unlike almost every other WWII airplane, the Lanc was good to go when it first went into production. The first Lancaster I to fly an operational mission, in March 1942, was virtually identical to the last one over Germany, in late April 1945. And there were only three Lancaster versions to ever be produced in quantity: the Mark I, with British-built Merlin engines; 300-odd Mark IIs, with Bristol Hercules sleeve-valve radials; and the Mark III, with American Packard-built Merlins. Not that Lancs were perfect; the Air Ministry decided that unless a modification produced major benefits, it was better to continue producing basic Lancasters without interruption. Ultimately, 7,377 were built, 430 of them in Canada. Manchester parentage wasn’t all bad. When the Air Ministry had first proposed that twin-engine bomber, they wanted all manner of irrelevant capabilities. The new bomber was to be catapult-launchable, so it could use existing RAF grass fields. It was to be quickly convertible into a troop carrier, and it needed to carry two big torpedoes for anti-shipping use. The silly requirements fell by the wayside, but the Manchester ended up with a 33-foot-long bomb bay for torpedoes that it never carried. No spar boxes crossed it, no fuselage framing obstructed it. That feature became part of the Lancaster, enabling it to carry the bombload of two B-17s over the same distance, and requiring only seven crewmen to do it rather than 10. The bomb bay also created the Lanc’s distinctive multipaned cockpit, which had to be set high in order to clear room beneath it for the forward part of the bay. A B-17’s bomb bay was aft of the flight deck. Lancasters rarely operated in daytime. Bomber Command’s nighttime tactics were entirely unlike the U.S. Army Air Forces’ formation-driven daylight raids. Lancasters and whatever other bombers were involved flew independently, in 200-mile-long “streams” driving through the night, each navigator on his own. The idea was to overwhelm the German radar, flak, searchlights and night fighters guarding a single gateway into the target rather than attacking on a broad front. Defensive armament was the Lancaster’s Achil­les’ heel. It had only three turrets—tail, top and nose—though they were hydraulically driven, a development the British had pioneered. The Air Ministry dithered about providing the Lanc with a belly turret, and ultimately came up with a twin-.303 mount operated via a periscope by a gunner lying prone on the bomber’s belly. The position was fittingly known as “the dustbin,” and when it was lowered into place, it slowed the Lancaster by 15 knots. In any case, only a few Lancs were fitted with dustbins, so the Luftwaffe quickly developed Schräge Musik, the fixed, upward-angled, dual 20mm cannons carried behind the cockpit on various night fighters. If the night was dark enough for British gunners to not spot them, the Germans would sneak under the bombers from aft or abeam and fire without even aiming once they were under a Lanc’s fat belly. It took a long time for the RAF to become aware of Schräge Musik, since virtually none of its victims survived. Even though the tail turret mounted four rapid-fire guns (1,200 rounds a minute each), they were .303-inch Brownings. The RAF knew it needed at least .50-caliber guns to pierce most aircraft armor, but in 1929 the British Army had decreed that Browning .303s would be the military’s gun of choice, since they assumed—wrongly, it turned out—that there were vast stocks of .303 ammunition left over from World War I. Other than the pilot, the tail gunner could be considered the most important member of the crew. He was more lookout than marksman, and it was up to him to instantly command the Lancaster’s standard corkscrew evasion maneuver if he so much as imagined spotting a Luftwaffe night fighter’s shadowy shape. The corkscrew consisted of a combination of near-aerobatic full-deflection banks in both directions, wingovers and max-performance climbs and descents. One Luftwaffe pilot even reported watching a Lanc evade him by doing a loop. Some tail gunners went through an entire tour (typically 30 missions, though the number varied) without ever seeing a Messerschmitt or Junkers. Others occasionally saw them but held their fire, preferring to not give away their presence. And then there were Lancaster pilots who commanded their gunners to fire at anything they saw, though it sometimes turned out to be another Lanc. Some Lancasters had armor covering the tail gunner’s torso, but soon most of it was removed to provide better visibility. Gunners then began removing the entire Perspex panel directly in front of them, for the clearest possible visibility. One thing a tail gunner didn’t lack was ammunition: 2,500 rounds per gun, stored in two big boxes just aft of the wing, for weight-and-balance reasons, and fed to the guns by long chutes. A tail turret typically fired only about 1,000 rounds during a night fighter engagement, often only a few hundred. The tail turret was a cramped workspace, and some gunners cut off the double entrance doors accessing the interior, particularly for better bailout capability. A tail gunner’s (and top-turret gunner’s) bailout door was the crew entrance door, near the aft end of the fuselage and just ahead of the horizontal stabilizer on the right side. Everybody else in the crew was expected to exit through a narrow hatch on the flight deck. It comes as no surprise that the Lancaster crew survival rate after being hit was low. A Lancaster cockpit held four men—pilot, flight engineer, navigator and radio operator—with a bombardier/gunner in the nose, several steps below and ahead of the flight deck. Two gunners aft—top turret and tailgun—filled out the crew. Unlike the B-17, which had armor throughout, Lancs went to war with just a small sheet of armor behind the pilot’s head and a pair of armored doors amidships with no obvious purpose. Though it was initially assumed that Lancasters would be flown by two pilots, the British quickly ran into a pilot shortage and could only spare one per aircraft. Britain had nothing like America’s Civilian Pilot Training Program, converting tens of thousands of farmboys into aviators before the U.S. even got into the war. University flying clubs were the best the Brits could do, for in the 1930s it was assumed that only English gentlemen could become pilots. Soon the RAF was forced to teach what might be considered commoners how to fly, and a new generation of flight-sergeant pilots went into combat. Whether they were the sons of Welsh coal miners or London cabbies, the flight sergeants were in absolute command of their Lancasters, regardless of the officer-and-gentleman rank of other crew members. While it might seem an insignificant system, the Lancaster’s heating ducts, fed by hot air from the engine nacelles, were among the aircraft’s worst mechanisms. The radio operator and pilot were nicely accommodated, the bombardier was sauteed, and the navigator and gunners froze. There were times when tail gunners with open turrets were too frostbitten to operate their triggers. A kerosene-fueled stand-alone heating system was cobbled together at one point, but it never worked well enough to become operational. Flying a Lancaster took substantial upper-body strength, since the controls were unboosted and heavy, though the Lanc reacted strongly and smoothly to yoke inputs. It was said that control forces were “like pulling on a pair of oars in a boat race.” Lancasters were surprisingly nimble and could be barrel-rolled and looped. Some had simple autopilots, but they were only used over friendly turf, since disconnecting them consumed several seconds. This meant that Lanc pilots soloed and hand-flew their airplanes for many hours, and sometimes had to do it while wounded. And these were pilots who typically had only about 300 hours before commanding their first Lancaster. 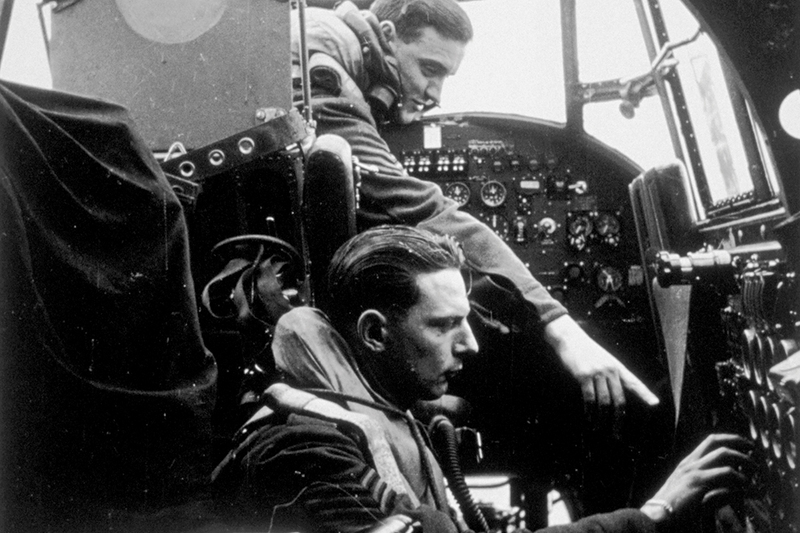 The RAF soon realized it had better train another crewman—typically the flight engineer—to be a “pilot assistant” able to at least cruise the big bomber back to Britain and set it up for a crew bailout over home ground. In fact there was probably ample second-pilot talent in every Lancaster cockpit, since navigators and bombardiers were often flight school washouts. One story has it that a washout crewman took over from a dead pilot and not only flew his Lanc back to England but landed it, at night. He was ordered to reapply to flight school. Lancasters inevitably flew into icing conditions, yet they had no wing or tail deicing boots—only propeller deicers. The awkward solution was a thick paste called Kilfrost, which ground crews smeared onto leading edges before a mission. Lancs were generally thought to handle ice well, and they had the power to climb out of icing layers. Though the Lancaster is usually thought of as a brute-force carpet bomber, it in fact helped to develop the delicate art of electronic warfare. When Lancs first went into operation, navigating from England to a target in the Ruhr Valley was a matter of dead reckoning by navigators who were not ancient mariners but boys who had taken a three-month course in chart-reading and calculating a heading. There were no radio navaids, and scant methods to accurately figure winds aloft or drift at night. Many Lancs ended up 50 miles from their targets. The first electronic aid was called Gee—a Loran-like system that received signals from ground stations that produced a cross-grid on a cathode ray tube and defined the airplane’s position. The Germans quickly learned to jam Gee, but it remained an aid to help bombers find their way home. Next came Oboe, so named for the sound it produced. Oboe was akin to radio-range instrument approaches, though of far greater range, extending 300 miles from Britain well into Germany. The most accurate radio-navigation system used during WWII, Oboe produced a steady on-course tone with off-course left and right signals. There was also a device code-named G-H, a kind of reverse Oboe. Aircraft that carried it could transmit a signal that ground stations used to provide a position fix. Most sophisticated of all was H2S—ground-mapping radar, thanks to the British invention of the cavity magnetron that made compact, high-power airborne radar possible. Lancaster navigators used it to very accurately find and identify targets, particularly if they were anywhere near a body of water, and then intercommed H2S data to the bombardier to be fed into his bombsight. Unfortunately for the British, German night fighters and their ground controllers learned to home in on H2S signals. This capability also complicated use of a Lancaster system called Monica—a radar unit in the tail turret that could zero in on pursuing night fighters. The night fighters learned that Monica’s beam could also help them zero in on the tail turret. Lancaster and B-17 proponents will argue forever over the merits of the two outstanding bombers, but no consensus is possible, nor will statistics help, since the airplanes flew such different missions. B-17s in the European and Mediterranean theaters bombed nearly every country in Europe plus several in the Middle East and North Africa. The Lancaster almost exclusively bombed Ger­many, with occasional sorties against targets in France and Kreigsmarine capital ships. So it should come as no surprise that the Boeing dropped more bomb tonnage than the Avro. Fighting against unseen Luftwaffe night fighters was an entirely different affair than the pitched daytime battles B-17s and their escorts fought, so loss rates aren’t comparable. The Manchester/Lancaster was designed after the Fortress was already flying and was a second-generation WWII heavy bomber. It could be argued that it had more in common with the B-29 than with the B-17—its emphasis on extreme range and maximum bombload, for example, and its pioneering use of a constant-cross-section fuselage. One unbuilt Lancaster variant, the Avro Model 684 Stratosphere Bomber, would have been a Brit Superfort. It was intended to carry a fifth Merlin engine, mounted inside the fuselage, the only purpose of which was to drive a huge supercharger ducted to all four wing engines. The cabin would also have been pressurized, assumedly by the same blower, and the bomber was intended to have an absolute ceiling of 50,000-plus feet. So let us simply offer praise and gratitude for the Avro Lancaster, which carried more bombs over Europe farther, per airplane, than did any other World War II bomber. Contributing editor Stephan Wilkinson recommends for further reading: Bomber, by Len Deighton; Avro Lancaster, by Bill Sweetman and Rikyu Watanabe; Avro Lancaster, by Richard Marks; Combat Legend: Avro Lancaster, by Harry Holmes; and Avro Lancaster, by Ken Delve. Night Raider originally appeared in the May 2018 issue of Aviation History. Subscribe today!